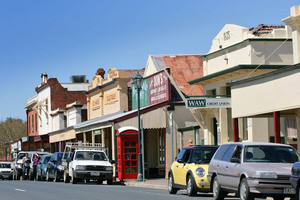 Chiltern is a fascinating historic village, built upon the solid values of its mining heritage. It’s distinguished by carefully preserved streetscapes with historic brick buildings and wooden verandahs. Visitors to Chiltern will experience the nostalgia of the past with all the benefits of good, old fashioned hospitality and warmth. Alluvial gold was first found in 1858 in the Indigo Lead about 3.4 km from the present township. Within 4 months there were between 12 000 and 15 000 miners on the field and numbers grew rapidly to over 20 000. A gold town of hessian and canvas, of sly-grog shops and some 32 hotels was established. In the same year the nearby New Ballarat Lead was discovered. But by 1859 it was all over. The easily-obtainable gold of the Indigo Lead was worked out and the majority of alluvial miners pushed on to other fields. Some miners remained and in 1859 sank a shaft, (now in Chiltern Park), and struck the Chiltern Lead. A new rush set in until these leads became too deep, and the water too difficult to remove, for the small parties to continue work. It was then left to the larger companies to recover the deeper gold through the use of better lifting and pumping gear. Shaft depths of 80 to 150 m were common. Some of the companies which worked the field were Barambogie, Chiltern Valley Consols, Great Southern and Chiltern Valley United, North Prentice, and the Chiltern Scotchman’s Company. The Federal Standard Printing Works, Main Street, Chiltern. Established in 1859, the Federal Standard is one of the few remaining, substantially-intact, provincial newspapers using original printing equipment. 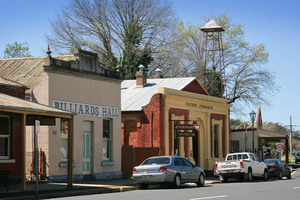 Court House (1865), Main Street, Chiltern. It is a classical brick building made from locally-fired bricks. The door and windows are topped by arches and it has a simple gabled court-room flanked by offices. St Andrews Church, High Street, Chiltern. Constructed in 1871-75, it is a small Gothic-style building in orange brick with cream quoins. St Pauls Church of England, Albert Road, Chiltern. This small, Gothic style church was constructed of locally-fired bricks with cream-coloured quoins. It was built in the years 1870-75. Athenaeum Library Museum, Conness Street, Chiltern. Classified by the National Trust, the building was constructed in 1866 by local builders from Rutherglen. It houses a collection from an Australian Goldfields Library of 1860-1900. Books are housed in original 19th century bookcases. A large collection of early photographs, paintings, clothing and memorabilia, locally-made gold mining and agricultural equipment and goldfields artefacts are on display. Grapevine Museum and Star Theatre, Main and Conness streets, Chiltern. The building was once the Grapevine Hotel constructed during the boom days of Chiltern. At the same time a grapevine was planted in the court-yard which has now grown to be the largest in Australia. The building now houses a selection of antiques. Lake View Historic Homestead, Victoria Street. Constructed in 1870 the house was the home of the celebrated author Henry Handel (Florence) Richardson. Many of her belongings are on display at the house. The property has been fully restored by the National Trust and is furnished in the period style. 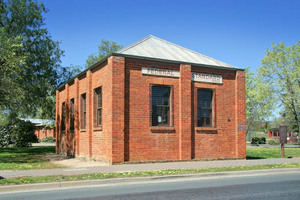 It is an excellent example of an early brick building of country Victoria. Dow’s Pharmacy, Conness Street. Constructed in 1868, it is now one of the few remaining colonial pharmacies in the country. It still retains its original shop fittings, records and pharmaceutical equipment and commercial products of the day. Lake Anderson, Victoria Street, Chiltern. The lake occupies the site once held by the Alliance Gold Mine and is now a picnic area, wildlife and bird refuge. A walking track leads from the lake to the centre of Chiltern. To the east of the Hume Freeway is the other section of the park which protects several historic sites associated with the gold mining era, such as the Indigo Goldfields Cemetery and the Magenta Mine. At the mine visitors can inspect the entrance to an open-cut goldmine. Take care if walking away from the formed tracks, as there are still many deep disused mine shafts. Wildlife ranges from eastern grey kangaroos, goannas, sugar and feathertail gliders, and common brushtail and ringtail possums. Trees of red box, white box and stunted red gum dominate the high ground with stringybark, grey box and ironbark on the flatter areas. Over 150 species of birds have been recorded including the rare turquoise parrot and regent honeyeater. Winter and spring are the best months for birdwatching as the ironbarks are in full bloom. Picnic facilities and fireplaces are available at Donket Hill, Magenta Mine and Frogs Hollow. The Chiltern Historic Drive is an excellent way of appreciating the park.